Once a hidden spring for the Heike family or sealed spring for Koubou, the water is sulfurous and you can enjoy views of the Nakatsugawa river while lounging in the outdoor bath through Spring to Autumn. 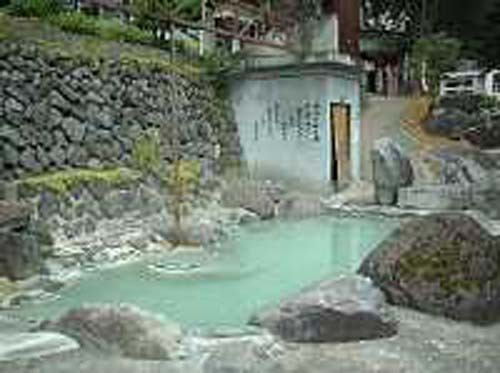 A secret hot spring spa with cloudy white water. The suggested season is autumn. Price "Adult 600JPY Child 250JPY"
How to get to the Yashiki Hot Spring Get on buses from Yuzawa Station(YS02) for 44 minutes and get off at Tsunan Town Hall(YS28). Change buses from Tsunan Town Hall (NA09) for 60 minutes and get off at Yashiki (NA37). 15 minutes walk from there to the Yashiki Hot Spring. From Tokyo Take route 353 → 117→ 405 after exiting the Shiozawa/Ishiuhci IC and it takes 95 minutes. From Niigata Take route 117→ 405 after exiting Echigo-Kawaguchi IC and it takes 110 minutes.